A miter box has two parts to it; a hand saw with small teeth and a box with slots to make accurate cuts. 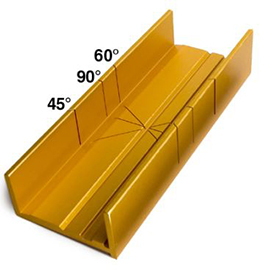 Miter boxes allow woodworkers to easily make angled cuts, usually at 45 or 90 degrees. Miter boxes are especially great for those who prefer to do things by hand instead of using power tools. They are also less expensive than power tools, which is why many prefer to use a miter box and saw. Many miter boxes are made of wood. 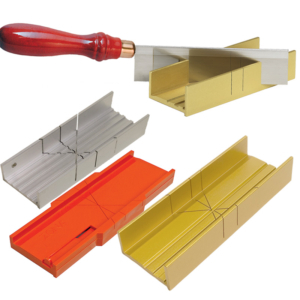 Zona’s miter boxes are made of aluminum or plastic. The models range in price and quality from a standard wide slot with 2 different angles to much finer slots for more accurate cutting and for use with very fine kerf saws that allow for highly accurate 90, 60 and 45 degree angle cuts. A miter box is used for more fine, delicate woodworking. It is best used to cut small or decorative pieces. Once you are ready to cut a material, you can clamp the miter box to a stable surface, or secure it through nut and bolt. Then, measure your cut length on your material with a triangle or carpenter’s square, making sure to measure the long end. Next, place the material and use the clamps to secure it in place. You can choose which angle to cut your material. Finally, place the saw through one of the grooves one the miter saw and make light cuts until you get your desired outcome. For woodworkers and hobbyists the miter box is a critical tool to have to ensure your angled cuts are accurate and consistent! You do not have to invest in expensive power tools, it’s lightweight and easy to carry, it makes delicate and accurate cuts, especially useful for intricate designs. If you are interested in purchasing a miter box, check out our full line of miter boxes and razor saws today!